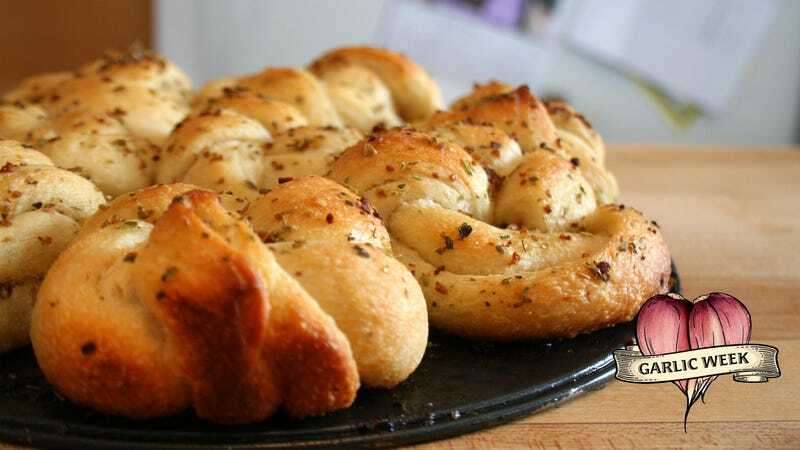 I don’t know whether you grew up around pizzerias that served garlic knots, but they were a critical element of my family’s Italian takeout orders. My brother and I would sometimes gorge ourselves on garlic knots with such abandon that we’d have hardly room for an actual slice afterwards. As my love of Sicilian pizza indicates, I have a warm, smooshy place in my heart for warm, smooshy carbohydrates. Bonus points if they’re slathered in garlic butter. The pizzerias where I live now don’t serve garlic knots, and so my choice was either to bake them myself or purchase a $600 plane ticket back to Newark, connecting through Minneapolis at midnight. I guess I was going to bake garlic knots. My friend Lisa emboldened my garlic-knot baking experiment, as she made her own picture-perfect batch of sourdough garlic knots last weekend using this recipe. My own sourdough starter is still emerging from its hibernation, and I worried it wasn’t lively enough to bake with quite yet. I chose the King Arthur Flour garlic knots recipe because I had King Arthur flour in the pantry, and because King Arthur’s recipes have never steered me wrong before. It called for instant yeast, no sourdough starter required. But in my garlic-knot research, I continued to stumble upon the Pillsbury garlic knots recipe in search results and blog comments. This simple recipe negated the need to make dough. Buy a tube of Pillsbury breadsticks, form knots, slather with garlic butter, call it a day. I was equally intrigued. So simple! No kneading, no dough rise, no need to run to the store to buy the King Arthur-mandated potato flour and non-fat dry milk that I’ll never use again. In the interest of a head-to-head comparison, and with the voice of Ina Garten—“store-bought is fine!”—in my head, I made both the Pillsbury and King Arthur versions. Drumroll please: Pillsbury ruled, both in terms of ease and the end product. My King Arthur version was not only a #fail, with the dough smooshing out in the oven to form rolls instead of knots, but it required many more ingredients and much more time. The Pillsbury version was inexpensive, completed in less than 30 minutes, and a visual ringer for the pizzeria garlic knots of my youth. Buy this tube, pop it open. The dough will be very, very soft and spongey, so handle carefully. Unroll and slice the dough into inch-thick strips, while keeping an eye on your salivating Labrador who might steal the whole lot. Make a knot with your dough strip, then tuck the free ends back into the interior of the knot, or tuck them under the knot. Arrange them in an ungreased 9-inch cake pan. Preheat oven to 350ºF. While the oven is heating up, slather those knots in a melted butter and olive-oil mixture to which you’ve added chopped garlic and herbs (or make it even easier with dried Italian seasoning). Slide the pan into the oven and bake for 15-ish minutes, or until lightly browned. Remove from the oven, let cool slightly before removing from pan, and serve warm.